Please check out #3, #2 and #1 of the series. If you have any suggestions, please let me know in the comments, thanks. I ended up catching a ride in Ofra to Jerusalem. 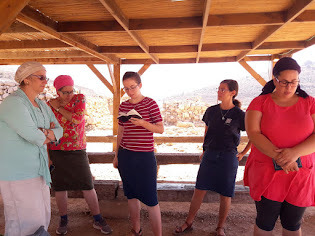 My hearing is awful, so I wasn't quite sure where they were taking me, but they said Derech Hebron, near the Menachem Begin Heritage Center which is close to Matan where I study once a week. That was perfect, since the Begin Center is a short walk from the Liberty Bell Park public toilets, which I've written about in #2 of this series. But when he stopped to let me (and his wife) off, I saw that we were in front of the "First Station," the newly opened fun place, which had once been the Jerusalem Train Station, when a train ride to Tel Aviv or Haifa was a long picturesque indirect adventure. And then it hit. There definitely are public toilets in the First Station, and since I saw people entering with exercise mats, (I could see that there was some sort of class about to start) the WC's must be open. And at my age, I've had to develop a good sense of where to find them. 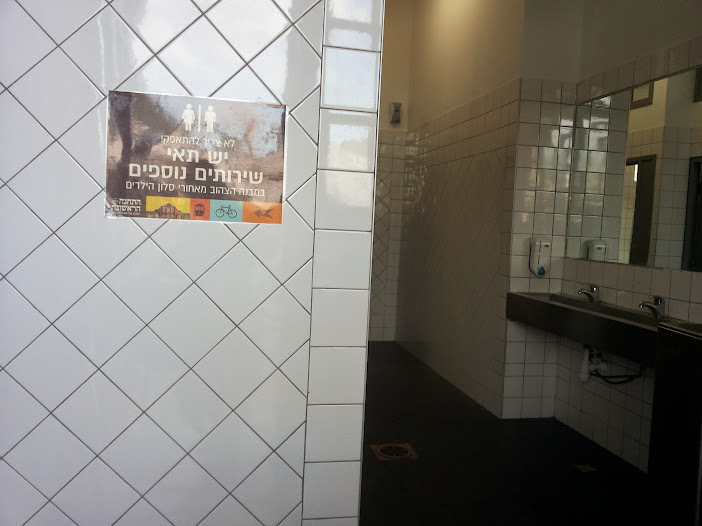 Maybe it's because this "fun spot" was supposed to appeal to the more secular Jerusalemite, or parents, sometimes fathers with daughters or mothers with sons, or whatever the reason, but this is an "everyone" public toilet. No public peeing for the men. Stalls for all. It could have been because the morning cleaning and maintenance hadn't yet been done because it was still a bit early, but there wasn't any toilet paper in my stall. Luckily I found some crumpled up tissue in my pocket. There wasn't a hook for my bag either, so I was forced to put it on the not too clean floor. But as they say in business, location is everything, and I was happy to find a reasonably clean WC just a few steps from where I entered. It's to the right of the main entrance. You can see the people exercising if you look closely. I didn't have the time to search out the other WC options there and have no doubt that during their main opening hours there are many more. If you can add information, then please write a comment, thanks. I found the other way out, which took me closer to Emek Refa'im and got to class safely on time. This post has been included in Haveil Havalim, the Vayera Version. Please stop by, visit the post, and share the blog love by visiting others' sites as well. 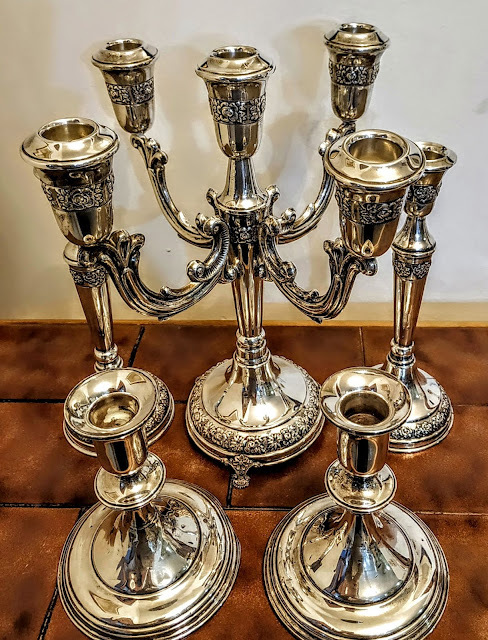 Get in The Mood for Chanukah! Shiloh, You Can't Miss It! Go Read This Week's Havel Havelim!